My first stop was the stunning International Financial Centre Tower 2 (2IFC), an 88-storey building at the edge of Victoria Harbour. At the time of its completion in 2003, 2IFC was Hong Kong’s tallest building – it has since been surpassed by the 484 meter International Commerce Centre in West Kowloon. 2IFC was featured in various movies, notably Lara Croft Tomb Raider: The Cradle of Life (in which Angelina Jolie leaps off the building and glides down before landing on a barge) and The Dark Knight. A fact not known to many is that 2IFC houses an observation room on the 55th floor that’s open to the general public – all you need to do is register at the reception desk on the ground floor. Entrance is free. The room doesn’t offer a 360-degree view, nevertheless, it’s more than worthwhile to head up to the 55th floor for superb views of Hong Kong. Just up the road from the Bank of China is the terminal for the funicular tram which brings visitors up to The Peak, arguably, THE place to get a breathtaking panoramic view of the Hong Kong skyline and its harbour. The ride up to The Peak is an experience in itself. Make sure you get a seat or a pole to hang on to as the incline is very steep! 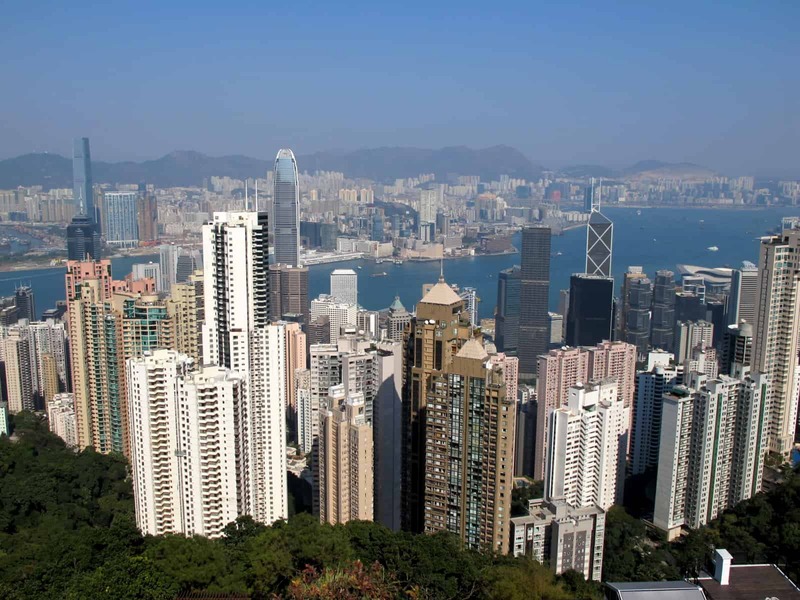 Once at the top, you have the choice of heading to the observation deck on the roof of The Peak centre (an entrance fee applies) or exiting the building and strolling to a little viewing terrace (the free option). The view from The Peak is something you won’t forget very easily. I was really lucky that day as visibility was extraordinarily good. Hong Kong panoramic view from Victoria Peak. 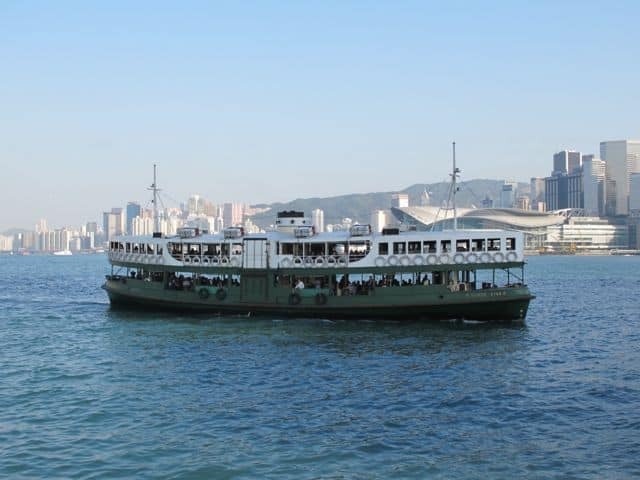 After several hours at The Peak, I took the tram down, walked through downtown Hong Kong to the harbour and caught the famous Star Ferry for the short hop to Tsim Tsa Tsui on the mainland (Kowloon). If you’re taking the ferry, I highly recommend sitting on the upper deck. I missed the sunset while I was having a beefball noodle dinner in Kowloon. 🙂 When I returned to the Tsim Sha Tsui waterfront, it was freezing and there were hundreds of tourists and photographers elbowing each other for the best view. I found a good spot and simply took in the stupendous view. The Symphony of Lights, a spectacular sound and light show, began moments later. It was a beautiful day and I had an awesome time seeing the Hong Kong skyline from different points. After finding this post, I’ve got two more locales to add: I didn’t know one could go up 2IFC or the Bank of China building. I’ve done the rest before and on this present visit, but I’m going to try photographing both the Hong Kong and Kowloon skylines, now that the latter has got a few more buildings to the repertoire. 😉 Thanks again for your post, Keith! We loved the skyline views in Hong Kong – especially from Victoria Peak at night. We went up in the later afternoon and stayed around so we got to see it by day and night. The light show is fun too. I love I.M. Pei’s Bank Of China. Even though it wasn’t built long ago, it has already become one of Hong Kong’s architectural trademarks. Great photos! Love the night pics Keith – especially the last one of the Symphony of Lights. How is the Hong Kong skyline compared to Shanghai? I have only been to Shanghai and I found that skyline to be immensely impressive. 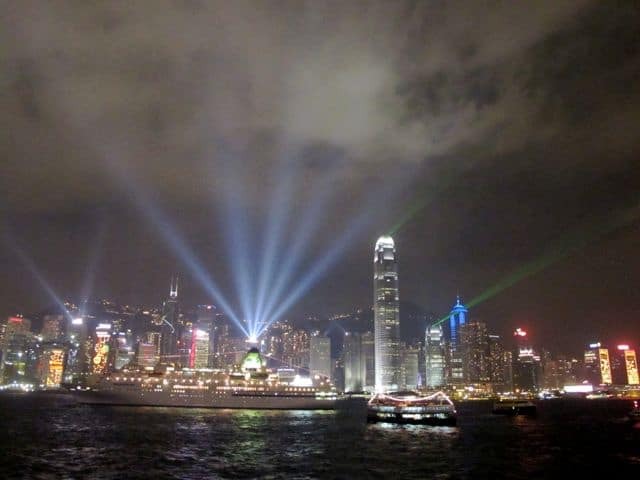 I have seen the Hong Kong skyline many times on both photos and on TV, and from that it seems really awesome. I love skylines and I will definitely try to visit Hong Kong some day. Thank you so much for sharing these beautiful pictures. I hope to see Hong Kong in person one day soon. Great post, very nice collection of photos. Thank you Clare and Michael for your comments. It’s certainly one of my favourite reasons to visit cities like Hong Kong and New York: gaping at the skyline! 🙂 Glad you liked the photos. Great pics Keith! I was in Hong Kong a few years back and was astounded by the sheer height of some of the buildings, particularly 2IFC. Unfortunately I didn’t get up any of the buildings like you did, but I thoroughly enjoyed the Symphony of Lights show – I was there during the shopping festival, so had the added bonus of fireworks, which were amazing! some great photos of one of my favorite cities!